FutureGrind is a futuristic arcade game with mechanics resembling those featured in such games as iStunt, OlliOlli, and Trials. The game has been developed by a two-man team from Canada, called Milkbag Games. 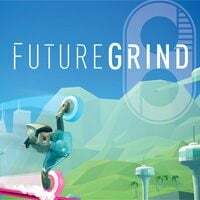 Among other platforms, FutureGrind is available on PS4 and PC. In the game, a player gets to control a motorcycle-like vehicle called the grinder with two wheels, each in a different color – one is blue, while the other is pink. A player has to beat consecutive tracks situated above the ground, which are built of three types of rails (blue, pink, and white). The difficulty lies in matching a wheel to the right rail, as attaching a wheel to a different colored rail results in short circuit along with several additional consequences. Along the ride, a player can (and even should) perform multiple stunts, such as jumps and spins. All these tricks are adequately rewarded with points, while flawless track completion adds a bonus multiplier to the score. One's objective is to get the highest score possible in particular stages of the game. Developers have prepared a number of diverse tracks set across different sceneries, as well as several grinder models that are unlocked for the points gathered during the game. The PS4 and PC release of FutureGrind features eye-catching 3D visuals with a dynamic camera. A player is accompanied by an original electronic soundtrack created by bignic.